Full of mythological themes, this wonderful "Interlude - Old World" tapestry shows the work of William Reynolds-Stephens from around 1891. Reynolds-Stephens (1862-1943) was born in Britain and studied in both England and Germany, attending the Royal Academy Schools in London and was awarded prizes for his art works. His works are influenced by the Pre-Raphaelites as well as being influenced by the Art Nouveau movement. Here we see a idyllic scene of women taking an afternoon nap or interlude among a marble castle, with wreaths of flowers around them uniting them. They are all dressed in the same blue flowing robes to suggest that they are ladies of the court. 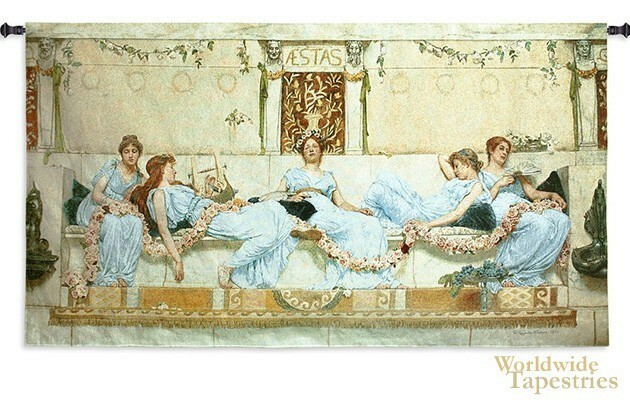 This fine art tapestry "Interlude - Old World" is lined and has a tunnel for easy hanging. Note: Tapestry rods and tassels, where pictured, are not included in the price. Dimensions: W 73" x H 41"